Less than a year before the U.S. was officially drawn into World War II with surprise attack on Pearl Harbor, American fighter pilot Lieutenant Thomas McBride provided this first-hand report on what he perceived to be the current status of the German air force (Luftwaffe). While in France he noted bizarre behavior of young German pilots, often with no more than a few hours of flight instruction, making deadly rookie flying mistakes and strafing ambulances and farm animals for sport and blood lust. Older pilots with slower reflexes were put in higher performance aircraft and could not compete with younger British pilots, while plebes in the same airplanes could not, due to insufficient training, handle the power and maneuverability. Blacking out under high G forces and not allowing sufficient altitude for vertical bombing runs spelled the end to many Luftwaffe airmen. The much-vaunted German Luftwaffe was, in Lt. McBride's opinion, not deserving of the credit and subsequently was not the fearsome enemy claimed. 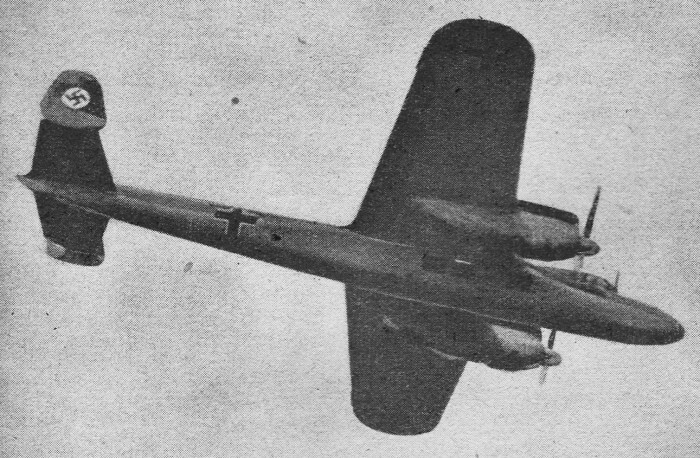 The Dornier Do. 17 "Flying Pencil" is far under-gunned. RAF pilots have little difficulty maneuvering into a blind spot and picking them off. 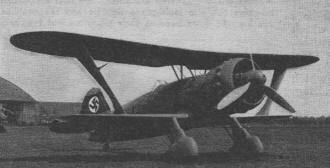 Many articles have been written about the inferiority of .the German Air Force, but those features were mostly speculation. 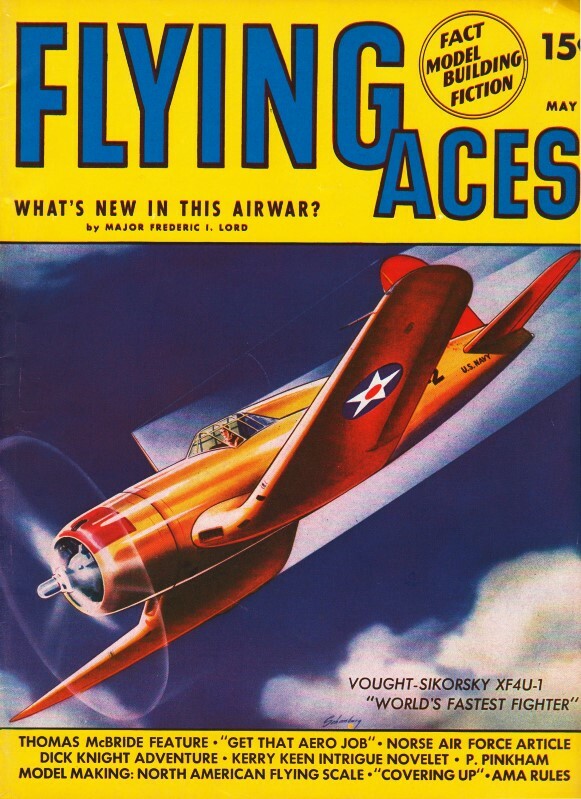 Now, however, Flying Aces presents the real, inside story! Ever since I returned from France, the one question that seems to be asked most often is: "Which are better, the British pilots and planes or the German?" That one query has been put to me so many times that I've lost track of the number long ago. I've even got so that I recognize that certain light in a person's eye before the question is asked, and start to answer automatically. That seems to be the subject everyone is interested in, more or less. And as this war, while it might not be definitely won or lost in the air, will at least have airpower as one of the deciding factors. I shall attempt in this article to answer many of the predominant queries. In my opinion and judging from what I observed while abroad, the British pilots and planes are decidedly superior to the Nazi pilots and planes. In the first place, the British flyers are given a minimum of 250 hours primary and combat training, by instructors who have had actual experience in combat units, before they are allowed to participate in any actual aerial warfare. Also, the British planes are built with quality as the keynote. During the first stages of the War, this was a definite handicap due to the typical English stolidness and their bulldog tenacity in sticking to a fixed idea. It is a national trait that will, in my opinion, eventually win the War for them. On the other hand, German policy is just the opposite. It remains to be seen which will prove the more effective in the long run. The young Nazi pilot has an average of 50 hours instruction before he is turned loose in a pursuit plane, which is just about the absolute minimum in which a man can learn to handle a 350 mile per hour ship. The mortality rate in the German training schools is naturally high, but the requests for entrance are so immeasurably greater that the loss factor is a minor consideration. According to a German officer I spoke to during my short term as a prisoner of war, the Nazi's are working on the principle that due to mass production of both pilots and planes - they can afford to lose approximately 4 to 1 and still stay even with the British. This advantage may have held true in the first stages of the War, but under the new British production methods it is doubtful if the same factors still apply. "British airmen," says our author, "receive a total of 250 hours of instruction against the slight 50 given German air trainees." One proof of the success of the British production method is the fact that before we went to France, Shorty Keough and I went up to Canada to enlist in the RCAF. (Editors note: Mr. Keough has been reported missing, believed killed in action.) We were accepted at the recruiting station in Niagara Falls and naturally expected to go right to work. We hung around for three days at our own expense. Then, finally, we requested an audience with the officer in charge of the recruiting center and demanded to know when we would go on duty. We were horrified to discover that the average waiting time was three months, proof that England needed planes much more than she needed pilots. At the present time, however, aircraft production has speeded up so much that any pilot who can pass the examination and has the desire to do so will not only be accepted immediately but will be shipped out on the first boat to England and given a machine to fly as soon as he lands on Britain's shores - this in spite of the fact that England's airplane losses exceed pilot losses almost two to one. Another big advantage of the, British method of training is that when the young Briton is graduated from Combat School he is assigned to that branch of the RAF in which he has shown the greatest adaptability. If, as in a great number of cases, he has shown more ability for the handling of big ships, navigation, and allied requisites demanded of a long-range bombardment pilot, he is assigned to bombardment. In the German Air School, however, because of the short time of the training period, they don't have ample opportunities to ascertain the peculiar abilities of each man. When he enters the School he is assigned to the type ship the Commanding Officer thinks he will be best adapted, and he is required to start and finish his training in that type machine. This cuts down the time required for experiment, but at the same time a lot of good pursuit pilot material is piloting bombers across the Channel in a job for which they are not temperamentally suited. And by the same token, many good bombardment pilots are out of place in cranky little fighters for which they have no real ability for handling. From what I have observed, nearly every major nation works on the principle that the best man to have in a fighter or interceptor is a young one. I know that I'm leaving myself wide open for beautiful arguments from some of the old timers who have on several occasions proved the superiority of experience over youth, namely in the Spanish War. Automatically excluded are men of the caliber of Major Fred Lord, who is, in my opinion, and in the opinion of many, one of the greatest air fighters that ever lived. 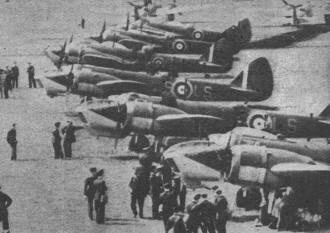 Bristol Blenheims are among the best machines in the RAF. They are not only medium bombers but also multi-place fighters and reconnaissance ships. Many German craft are brought down because their pilots are not temperamentally fitted for the job given them. The Nazi Air Force carries the young man idea to extremes, though. Practically every German airman with any pre-war experience was, at the outbreak of hostilities, immediately assigned to bomber outfits on the assumption that more experienced men were needed in that arm to handle the more expensive and more complicated multi-motored ships. The 17- and 18-year-old boys who joined the Nazi Air Force were sent to pursuit and interceptor units on the assumption that what they lacked in ability and experience would be made up by their recklessness in action. In peacetime, recklessness in an airplane is frowned upon by the powers that be, but wartime recklessness is a very decided asset in a fighter. There are many cases of atrocities and murder of civilians that can be directly traced back to the extreme youth of the Nazi pursuit pilots. On many occasions I have heard of, and in more than one instance I have seen, the wanton machine gunning of civilian refugees by some Nazi pilot in a Messerschmitt. In some cases they have even carried this to extremes. In one particular instance an American ambulance driver, Sam Pierce by name, was returning to the front to pick up a load of wounded. As he was driving along, the road in front of him suddenly erupted little spurts of dust. Being experienced in that sort of thing, Sam immediately recognized it for machine gun bullets. The road being right out in the open, he realized he didn't have a chance to run for it, so he jammed on his brakes and before the ambulance came to a stop he had dismounted and taken cover behind a boulder on the side of the road. He gained the shelter of the boulder just as the German fighter reversed direction and headed back for another strafe. 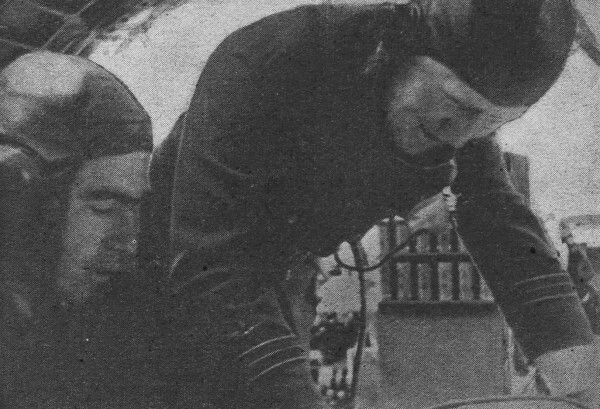 For more than 45 minutes, the Messerschmitt kept Pierce dodging in an attempt to keep the rock between himself and the plane. In the meantime, the Nazi pilot filled the ambulance with holes. If there had been anyone inside, they would have been mincemeat when he finished. Finally, the young German, probably running low on gas, decided to head for home, but the killing fever had him in its grip so strongly that he turned around for one more shot at the boulder and the ambulance. And as he pulled up, he let fly with his machine guns at two cows grazing in a field nearby, killing both of them. When this story was told to a German officer in Paris after the occupation, he said : "We are not beasts. But those young boys in the heat of battle lose their reasoning. It cannot be helped." Well, perhaps it can't be helped, but there must be something besides youth that makes them act that way. The British are young, too, yet even the Germans didn't accuse them of machine gunning civilians or grazing cattle. While we're on the subject, one of the Nazi excuses for the murder of refugees was that a road is a military objective. Granted, any road is a military objective no matter how unimportant it is, but there can be no excuse made for machine gunning a column of refugees when there is not a military car or conveyance of any sort within sight. Machine gun bullets do not make a road unfit for military use as bombs do. Another thing: The machine gunning of ambulances. During the first months of the War, all ambulances were painted white. Then the Allies realized that instead of protecting them they just attracted attention, so they painted them a dull O.D. color and marked them with a big red cross on both sides and on the top., They later found that the cross on the roof was being used as a target by the Nazi ships. Finally, for their own protection, they painted out the cross, colored the ambulance the typical green and brown camouflage, and took their chances with army transports, realizing that it was safer, that way. According to Lieut. McBride, the Henschel Hs. 123 is not a bad ship. However it is admitted that it is too slow and has weak fire-power. So much for the tactics and comparative abilities of the British and German pilots. Now let us turn to the planes. In bombardment types, the old question arises: Which is better, quality or quantity? The Germans at present have quantity and the British have quality. 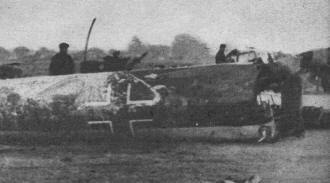 It is not meant to infer that the German bombers have a habit of falling apart in the air or any such extreme. When I say that the British have superior machines, I mean that they are better engineered, have better materials and instruments, and have a longer operating life with fewer breakdowns and need less care. And now the question uppermost in everyone's mind. Which is the better fighter, Spitfire, Hurricane Messerschmitt or Heinkel? Well, let's take them apart and see. First, we will match them as to type. The Spitfire and Heinkel come under the heading of interceptors and therefore are not really fighters. They are used mostly against bombers over home territory. I don't know of any case where a Heinkel interceptor has been shot down over England, and the ship is still more or less of a mystery except for rumors. One of the most persistent rumors, however, is that the Heinkel has acquired the reputation of being a pilot killer. It is evidently so overpowered and so lightly built, to obtain the maximum speed and rate of climb, that it has turned into a tricky, undependable, and unmanageable ship. To bear out this rumor is the fact that the British bomber pilots on sorties over Germany report being attacked by Messerschmitts quite often, but very seldom do they see any Heinkels. Although the Spitfire cannot maneuver with the Hurricane, it can and has given a good account of itself against Messerschmitts in the defense of England although it was not designed with that purpose in mind, being primarily for use against bombers. It has a rate of climb of more than 5,000 feet per minute, and although some maneuverability was sacrificed for speed and climbing ability the British again seem to have struck the happy medium. And now the German Messerschmitt 109 and the British Hurricane: According to the German Air Force chiefs, the Me. 109 was the second fastest plane in the world, the Heinkel being the fastest. But in spite of all its publicity, it has turned out to be just another fighter with both its good points and its bad points. The main good points are its speed and ceiling. It was the consensus in France that the Me. 109 had a slight edge on the Hurricane in those respects. Here again the old German habit of sacrificing everything for superiority in particular traits crops up. The clipped wings on the Me. 109 cut down its maneuverability to such an extent as to give the Hurricane that extra advantage which is all that is needed to spell the difference between victory and defeat. Here again the British seem to have split the difference. The Hurricane is plenty fast, being able to clip along at nearly 400 miles per hour, and yet it is much more easily and quickly handled in a dogfight. I have spoken to several RAF men from the Advanced Air Striking Force in France, and their opinion was that all other things being equal there were three ships that could lick a Me. 109 every time, the three being the Hurricane, the Curtiss Hawk 75, and the Westland Lysander. It surprised me to hear the Westland Lysander mentioned in the same breath as the Hurricane and Hawk since the Lysander is a two-place high-wing Army Cooperation monoplane that was not intended for combat work. They assured me that it was not a slip of the tongue but that it was an actual fact that the Lysandelrs were hanging up an enviable record against Me. 109's. It seems that the Lysander is capable of an extremely tight turn, and when attacked by a Me. 109 it would immediately go into a vertical. And as the Nazi went by, the Lysander would come out of the vertical and be on the Me. 's tail. If by this time the Me. was still going strong, the Lysander would hit for the carpet and go hedge-hopping home between the trees. The 109 wouldn't dare go down as low as a Lysander, and would usually give up in disgust. The Hurricane, as has been said before, is more maneuverable than the Me. That statement also applies to the Curtiss Hawk. The Hawk and Hurricane-are about equal in this respect but the Hawk has a little trick up its sleeve discovered by the French in the early days of the War. A French pilot flying a Hawk one day found a Me. 109 on his tail. He tried every trick in the book to escape and finally wound up doing a series of dives and zooms in quick succession with the Nazi right on his tail. Finally, the Frenchman, almost ready to give up, came out of the bottom of a dive and, pulling into a quick zoom, cut his throttle all the way. The big radial engine front acted like a brake, cutting the plane's speed instantly by about 100 miles per hour. The Nazi, quick on the trigger, cut, his throttle also, but since the streamlined nose of the Me. 109 offered no resistance the Nazi machine went right on past the Hawk and was cold meat for the Frenchman. As soon as the story was told back at the airdrome, everyone flying a Hawk tried the same tactics. The Nazis never did get wise to it, and they were still being taken in by the same trick up until the time I left France to return to America. This maneuver-if it can be called that - cannot be utilized by the British, however, because of the fact that RAF first-line fighters are all powered with streamlined liquid-cooled power plants. Now, above England, it's superior fire-power that knocks down German combat craft. To completely boil down this pro and con discussion, the real reason for the British superiority is that their pilots are trained better and their planes are built for service flying and not merely for war. This, of course, means that they are constructed of the best materials and only very close tolerances are allowed. Don't for a moment, however, think that the Germans are anything near "cold meat." They fly like demons, shoot like devils, and have the courage of real fighting men.